You never know who you're going to bump into or where. When Anthony Watts went gutter crawling earlier today he bumped into Tim Ball. Tim's the chap who promotes paranoid conspiracy theories when he's not being sued for defamation. He's also one of the authors of that really dumb book about slaying sky dragons, which rejects the greenhouse effect. Anthony Watts bans the sky dragon slayers except for Tim Ball, for some weird reason. Today at WUWT there are so many utterly nonsensical statements rivalling russian steampipes causing global warming. Before you read more, I recommend putting the vice on your head. 1750 was 264 years ago or, if you prefer, 1850 was 164 years ago, not "a couple of years ago". A claim cannot be incredulous. That's a word normally reserved to describe a person. I'm incredulous at the notion that a professor is so ignorant. The claim that a fractional increase in CO2 from human sources, which is naturally only 4 percent of all greenhouse gases, become the dominant factor in just a couple of years is incredulous. This claim comes from computer models, which are the only place in the world where a CO2 increase causes a temperature increase. What planet do Anthony Watts and Timothy Ball live on where CO2 doesn't keep it nice and warm? Where an increase in CO2 doesn't cause a rise in temperature? It's not on earth that's for sure. Oh, there's lots more where that came from. Timothy resurrected some paper that was doing the rounds a few years ago. He's trying to say that all the measurements of atmospheric CO2 from all the different places around the world are "wrong". Everyone is fiddling the data. If only Timothy in his paranoid fantasies could figure out how they are coordinating the hoax and why no-one else has discovered it. What a load of utter nutters there are at WUWT. If you want to see the crackpottery, you can read the archive here. There is hardly a sentence in the long article that makes any sense at all. What is even weirder is that normally sane people like Nick Stokes actually commented on the article. Steven Mosher, too, who isn't quite as sane but in comparison with most of the nutters at WUWT appears abnormally normal. The batty duke from Duke chimes in as well. (How he ever got a job teaching undergraduates at a University like Duke is one of the mysteries of the US education system.) Maybe there have been so many really dumb articles that the people who normally avoid any association with the unsavoury Timothy Ball can't hold out any longer. Steven Mosher, you must be kidding. Take out just the anthropogenic portion of CO2 radiative affects and rerun weather (or if you prefer, climate) models at a 30 year time span (along with the necessary multiple trials). Run them just like the IPCC does. You would not be able to use the difference between the two sets of multiple spaghetti runs to say anything at all about the weather future. Guess what, Pamela, it's been done and there is a big difference. Look folks, the thing that determines weather thus climate is geography and your location in it, interacting with large and small scale oceanic/atmospheric teleconnected pressure systems. It is the battle of pressure systems, air heated or cooled, ladened with or not ladened with moisture, and traveling over your geographic location. 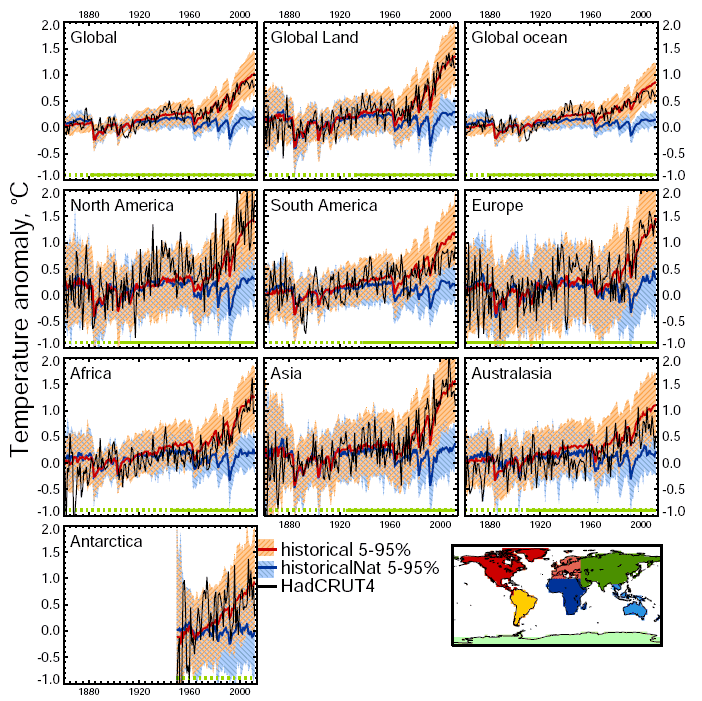 Which one of these could anthropogenic CO2 substantially change, and even create a trend? It would have to be able to get in that powerful mix and muscle it around. It’s like saying the mouse lifts the elephant and hurls him out of the room instead of the elephant leaving under its own power. So back to you Mosher. I am not saying that atmospheric gasses are not capable of reabsorbing and re-emitting longwave infrared radiation. Of course they are. I am saying that the anthropogenic CO2 molecules (a tiny, tiny fraction of all the LWIR absorbing/reemitting molecules present) in the atmosphere at any given time are not capable of changing the weather, thus the climate. Doesn’t have the cojones and the noise of natural forces buries it. The "4%" might be the increase in CO2 compared to ALL greenhouse gases (I will check). But in that case it is still misleading; I recall current wisdom is greenhouse gases such as water vapour are considered a feedback not a primary cause of the greenhouse effect. I give up. The opinion piece is so bad it is not even wrong, as they say. It's basically a conspiracy theory. how does the typical wattsian reconcile such a post with their typical "nobody denies..." replies to calling them deniers? By denying them. For instance, Meteormike went on and on about how no True Deniers (TM) claim that cooling is imminent. Pointing out that Watts had, just a couple days prior, was fruitless: Meteormike replied that Watts doesn't claim that cooling was imminent. Cognitive dissonance is not a problem with deniers. My favourite bit was FE saying "Sorry Dr. Ball, this is such a bunch of nonsense and misinterpretations that I don’t even know where to start" followed by philjourdan saying "A nice wrap up of CO2 and where it comes from and is going. I notice some sniping at the edges. But the central point remains uncontested". WTF?!? FE says, correctly, that its "a bunch of nonsense and misinterpretations" and that's sniping at the edges? I wonder what a full-on hit is supposed to look like. No comment on the Timothy Ball fiasco, but the Pamela Gray mouse v. elephant is a clever word picture, although it's not quite as clever as the 4hiroshimas widget I saw for the first time yesterday. I found the little widget while researching Paul Beckwith's claim the Arctic would be ice free in the future last year. Matt, as Ray Pierrehumbert says the evidence should cause us to be alarmed, and I would add that a degree of allowance should be made for known and unknown unknowns (plus maybe even some unknown knowns, as it were), but sometimes people who ought to know better lean too far toward expecting geological processes to be apparent on human time scales. That some of them, e.g. Arctic sea ice loss, are nonetheless doing so is properly frightening, but in the absence of a clear physical understanding expecting such processes to happen essentially instantly isn't reasonable. We should bear in mind that from the POV of the long-term evolution of the climate system whether the Arctic first goes sea ice-free this year, next year or in 2035 is a relatively minor point. That we're having such a discussion at all is the scary bit. 400 PPM of CO2 would be 0.4% of atmospheric gases, commonly called "air". Since O2, N2 and Ar are not considered greenhouse gases, CO2 would be 99% of greenhouse gases in dry air. 400ppm would actually be 0.04% (400/1,000,000)*100, but that's not what Ball is getting at. He's playing a familiar "Skeptic" game, achieved by completely ignoring the carbon cycle, of conflating gross emissions (primarily natural) and net emissions (primarily anthropogenic). It's nonsense, and transparent nonsense at that, but if you suffer badly enough from confirmation bias and cognitive dissonance it is comforting. Yes, it is an Argument from Ignorance, cleary an Argument from Personal Incredulity. No wonder it's such a hit in the denial-sphere. They're not just losing it anymore, are they? It is now definitely missing, and the few lonely souls trying to find it again are being threatened with lawsuits. Such a pleasure to watch vicariously (thanks for taking so much for the team, Sou). I'm not sure about the 4% vs 43%. That sentence is so badly phrased that it could mean just about anything. Yes, I'm *incredulous* that a professor would be so poor at communicating what he really means. The pseudosceptics are an amusing crowd, though. Whatever some of them claim (the "lukewarmers", I suppose), many of them are not just GH deniers, they are CO2 deniers (ABCD). The CO2 figures are fake, and even if they're not, it's natural and nothing to do with us, and even if it is to do with us, it doesn't matter because the temperature data don't match the models so GH theory is Junk Science, and even if it isn't, that's a good thing because we are heading into a New Ice Age, and anyway CO2 is plant food and anyone who doesn't agree wants the poor to starve or freeze to death. Gray's comment is bizarre. The one belief the fake sceptics share is that the IPCC and Climate Science as a whole is wrong because it bases all its models on CO2 and they are junk because they don't agree with the data. Gray now claims that the models show no discernible difference if "Take out just the anthropogenic portion of CO2 radiative affects ". Is she denying the reasons for her own denial?